1. a small, local, involuntary, muscular contraction, due to spontaneous activation of single muscle cells or muscle fibers. 2. the quality of being made up of fibrils. 3. the initial degenerative changes in osteoarthritis, marked by softening of the articular cartilage and development of vertical clefts between groups of cartilage cells. 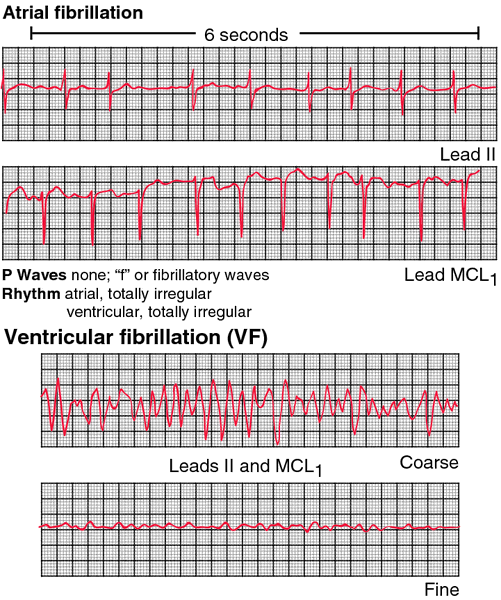 Fibrillation on an electrocardiographic tracing. From Fenstermacher and Hudson, 1995.
atrial fibrillation a reentrant cardiac arrhythmia marked by rapid randomized contractions of the atrial myocardium, causing a totally irregular rapid atrial rate. It is recognizable on an electrocardiogram by the absence of P waves and an irregular ventricular response. It may be controlled by drug therapy or cardioversion. ventricular fibrillation a cardiac arrhythmia marked by fibrillary contractions of the ventricular muscle due to rapid repetitive excitation of myocardial fibers with ineffectual ventricular contraction; on the surface electrocardiogram it is characterized by lack of identifiable QRS complexes. This is a frequent cause of cardiac arrest. An apparatus called a defibrillator is used to alleviate it by delivering an electric shock to the heart muscle; this depolarizes the myocardium and ends the irregular contractions so that the heart can resume normal, regular contractions. fibrillation in which the normal rhythmic contractions of the cardiac atria are replaced by rapid irregular twitchings of the muscular wall; the ventricles respond irregularly to the dysrhythmic bombardment from the atria. Fibrillation in which the normal rhythmical contractions of the cardiac atria are replaced by rapid irregular twitchings of the muscular wall that cause the ventricles to respond irregularly. a cardiac arrhythmia characterized by disorganized electrical activity in the atria accompanied by an irregular ventricular response that is usually rapid. The atria quiver instead of pumping in an organized fashion, resulting in compromised ventricular filling and reduced stroke volume. Stasis of left atrial flow increases the risk of stroke as a result of clot formation. AF is associated with hypertension, diabetes, age, rheumatic heart disease (left atrial dilation), mitral stenosis, acute myocardial infarction, and heart surgery, or it may be idiopathic (lone AF). Treatment goals are to control the ventricular rate by creating atrioventricular block, to prevent stroke through the use of anticoagulants, and to convert to sinus rhythm. Treatment categories include paroxysmal, persistent, and chronic. AF is called controlled if ventricular response is less than 100. If ventricular response is 100 or more, it is called uncontrolled atrial fibrillation. Cardiology The most frequent sustained cardiac arrhythmia, which is very common in older individuals and characterized by disorganized electrical conduction in the atria, resulting in ineffective pumping of blood into the ventricle; ± 1 x 106 in US have AF; 80% also have heart disease Etiology HTN, heart failure, valve disease–mitral valve prolapse, rheumatic heart disease, especially when associated with clinically silent mitral stenosis, dilated cardiomyopathy, pericarditis, cardiothoracic surgery, hyperthyroidism, alcohol use or withdrawal, acute illness–eg, pneumonia, decompensated COPD, sepsis, and other conditions, PTE, sympathetic triggers–eg, cocaine, amphetamines, atrial myxoma, tachycardia-bradycardia syndrome, lone AF Risk factors DM, MI, HTN, ↑ age–peak at age 75-79; untreated AF Pts suffer strokes at a rate of 4.5%/yr Sequelae Loss of coordinated electromechanical activity, resulting in blood stasis and atrial thrombosis; AF precipitates heart failure as it results in the loss of the so-called atrial kick, which accounts for 5-30% of cardiac output, and a shorter diastole Clinical Palpitations, dizziness, dyspnea, angina, syncope EKG Narrow QRS complex < 120 msec with no interval between the QRS complexes; absent P waves in leads II, III, aVF, and V1-2 Workup Hx, especially alcohol or drug abuse, thyroid studies, CBC, chemical profile, CXR for pulmonary disease and/or heart failure, EKG, echocardiogram Diagnosis Transesophageal echocardiography identifies Pts with atrial emboli requiring short-term anticoagulation with heparin before cardioversion. See Linkage analysis Management-acute Adenosine, digoxin, magnesium sulfate, CCBs–eg, verapamil, diltiazem Management-long term Cardioversion, anticoagulation Medical conversion of AF Class IA antiarrhythmics–eg, quinidine as well as disopyramide, procainamide, performed as an inpatient; class IC agents–eg, flecanide, propafenone, or class III agents–eg, amiodarone, sotalol are increasingly popular in acute conversion of AF to a sinus rhythm, as is Ibutilide Interventional conversion of AF Failure of medical conversion of AF to a sinus rhythm, accompanied by ventricular rates unresponsive to antiarrhythmics, requires AV node-His bundle ablation with implantation of a rate-adaptive VVI pacemaker, or preferably, atrial or dual chamber pacing, as the incidence of AF is lower than with VVI pacing. See Atrial kick, Atrial flutter. A heart defect involving the upper chambers in which the rate at which they contract is chaotically irregular both in force and speed. It may be caused by heart muscle damage from RHEUMATIC FEVER or ATHEROSCLEROSIS or by thyroid overactivity. A new focus in the muscle may set up its own rhythm and this may compete with the normal rhythm. Only some of the irregular beats are transmitted down to the lower chambers (ventricles) and the pulse is correspondingly irregular. Atrial fibrillation is common and accounts for one third of all strokes in people over 65 years of age. A rare familial form has been recognized. Treatment by radio frequency ablation using a catheter in a pulmonary vein is usually effective in controlling the disorder. Fibrillation of recent onset can usually be stopped by a single oral dose of flecainide or propafenone. n quick uncoordinated twitching movements of the muscles of the atria of the heart; may result in a lack of regular pulse and lowered circulation. Fibrillation in which normal rhythmic contractions of the cardiac atria are replaced by rapid irregular twitchings of the muscular wall. n a heart condition characterized by rapid random contractions of the atria at the rate of 130 to 150 ventricular beats per minute. a cardiac arrhythmia marked by rapid randomized contractions of the atrial myocardium, causing a totally irregular, often rapid, ventricular rate. There is no synchronous atrial contraction and the ventricles beat irregularly. The heartbeat is irregular, the pulse is irregular in rhythm and amplitude. Common in the horse; an affected animal can still race but the performance is poor. Occurs in dogs in association with cardiac disease, particularly idiopathic congestive cardiomyopathy, and electrolyte disturbances. a cardiac arrhythmia marked by fibrillatory contractions of the ventricular muscle due to rapid repetitive excitation of myocardial fibers without coordinated ventricular contraction. Ventricular fibrillation is a frequent cause of cardiac arrest. An apparatus called a defibrillator sometimes is used to alleviate fibrillation. The defibrillator delivers an electric shock to the heart muscle, depolarizing the muscle and ending the irregular contractions. The heart is then able to resume normal, regular contractions. High cholesterol didn't appear to increase the risk of atrial fibrillation. Dr Christow said: The finding of a higher rate of previous stroke in the asymptomatic patients despite no differences in the number of stroke risk factors may be explained by a longer but undiagnosed history of atrial fibrillation. The European Society of Cardiology guidelines recommend use of surgical and catheter ablation procedures for the treatment of atrial fibrillation, if anti-arrhythmic drug therapy results are inadequate. Atrial fibrillation was said to be present if ECG shows irregular or undulating baseline, absent P-wave, presence of fibrillatory 'F' waves and varying R-R interval. The investigators concluded that the available evidence doesn't support the notion that statins reduce the risk of atrial fibrillation (BMJ 2011 March 16 [doi: 10. Stroke prevention with aspirin, warfarin and ximelagatran in patients with nonvalvular atrial fibrillation. But patients with well-controlled diabetes (HBA1c 7 percent or less) were about equally likely to have atrial fibrillation as people without diabetes. Over 3 years, they identified 719 women who had a confirmed history of atrial fibrillation and 966 controls who did not, selected at random from the Group Health enrollment but matched for age and presence or absence of treated hypertension. Oral bisphosphonates and atrial fibrillation--is there a link? Atrial fibrillation is an independent risk factor for stroke, increasing a person's risk 3-to 5-fold. 1-fold greater risk of developing atrial fibrillation for each quartile increase. Although the cause is often unknown, atrial fibrillation is a common heart rhythm problem and is usually successfully treated with drugs.